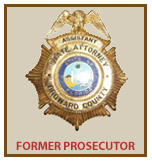 Fort Lauderdale Criminal Defense Attorney – Lea P. Krauss, ESQ, P.A. When an arrest or criminal investigation puts your livelihood and freedom in jeopardy, there simply is no substitute for having a skilled and proven criminal defense attorney. Led by a Former Prosecutor, hiring the criminal defense firm of Lea P. Krauss, can be the difference between a prison sentence and reduced or dismissed charges. Our chief goal is to protect your rights and ensure you receive optimum representation. We handle all criminal charges and have particular expertise in the highly specialized areas of DUI / DWI, drug and theft defense. If you or a loved one has been accused of a crime, you need a seasoned criminal defense attorney in your corner. Please contact us before or after charges have been filed for a complimentary case evaluation by an veteran Florida criminal defense attorney. By applying our vast resources, we may be able to minimize or eliminate the penalties you face. We will work tirelessly to ensure the best possible outcome for your case. An Arrest does not have to result in a conviction & a lifetime criminal record! We understand that when our divorce clients come to us for help, they are often facing the breakdown of a family unit that was once a source of emotional and financial support. The prospect of divorce initiates a wide range of emotions and can be traumatic for most individuals. Hiring a divorce lawyer early in the process can ease some worries and may even help resolve your case quicker. We offer caring counsel to our clients while providing high level negotiation skills and assertive representation. Ms. Krauss is also a Florida Supreme Court Certified Family Mediator. As a Family Mediator, Ms. Krauss can assist you and your clients in all family law matters. The consummate goal of mediation is to aid the parties in resolving conflict in a cost-effective manner. Recognizing the parties know more about the issues, the final settlement decision rests with the parties. Ms. Krauss strives to ensure your mediation process results in a positive and mutual agreement, while providing unparalleled dispute resolution services.